I am made so happy reading again Henry David Thoreau’s Walden. The rhythm of his sentences move with my breath, or it is that as I flow through his sentences I experience a quiet and calmness that I enjoy in very few other instances in my anxious life. I can be with Walden anywhere. He writes in “Economy’: “We might try our lives by a thousand simple tests; as for instance, that the same sun which ripens my beans illumines at once a system of earths like ours.” I like that the verb Thoreau employs is a clear active one and not the vague verb ‘know,’ though I understand ‘try’ to mean ‘to know.’ There are so many ways to measure our existences; to consider our lives; to accept that we live. Thoreau calls these ways simple tests though they seem to me to have little in common with the high stakes testing and accountability measures that pervade our society. These ‘tests’ of which Thoreau speaks are ways of recognizing that we are alive, that we exist, and that the universe is not opposed to us! These tests are not summative or judgmental, nor are they even formative and developmental. These tests are the measure of the Now, “the meeting of two eternities, the past and future, which is precisely the present moment.” These tests are the measure of our life’s openness and not the measure of how open are our lives. Carrie Newcomer sings, “The wise men say, there are a thousand ways to kneel and kiss the ground!” Thoreau’s thousand tests are the measure of our joys. 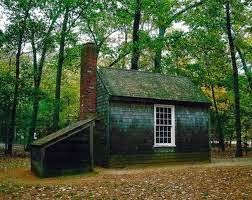 Though Thoreau’s neighbors’ question his life-choices, their questions are really answers and hence, judgments about his life; Indeed, many of our questions are nothing but answers and often are attacks on the choices others that us have made. These judgments derive from the uncoupling of the two eternities. As an example of how we might try our life by a simple test Thoreau offers this: that if we were to ‘consider’ that our existences are merely part of a vast universe—Thoreau intentionally uses the plural ‘earths’— and ‘consider’ that in our lives we were only a part of Nature, neither isolate nor extraordinary; and ‘consider’ that what we experience belongs to us as our experience, even as the experience of others belongs to them; and ‘consider’ that what we know as our realities are experienced everywhere and elsewhere by others the same and different than us; and ‘consider’ that whatever I see exists only as my individual perspective; then we live wholly present. And then Thoreau (to my mind) remarkably adds: “If I had remembered this it would have prevented some mistakes.” Not all his errors, but certainly ‘some mistakes.’ I admire his honesty. There really are so many ways to live life.